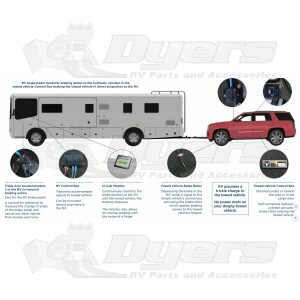 RV brake pedal transmits braking action to the hydraulic cylinder in the towed vehicle Control Box braking the towed vehicle in direct proportion to the RV. InstaBrake’s 2 second response time takes those long terrifying seconds out of an emergency braking situation. Triple Axis Accelerometers 2 in the RV to transmit braking action One for the RV brake pedal. A second for reference to measure the change in angle of the brake pedal and cancel out other signals from bumps and turns.